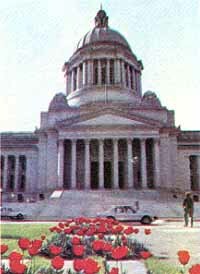 Located at the southern tip of Puget Sound, Olympia, the State Capital, also is the seat of Thurston County. It lies at a junction of Highway 101 and Interstate 5, between Tacoma and Chehalis. Settlers first arrived in the late 1840s. Their community, Smithfield, became the site of the first U.S. customs house and was renamed Olympia for the mountains to the west. The town flourished, became the state capital with statehood in 1889, and an important economic center. Today Olympia, population 42,514, is a manufacturing, shipping and commercial hub. The Olympia Brewery in nearby Tumwater, Fort Lewis Military Reservation, tourism and fishing also infuse the city's economy. Attractions include the State Capitol Museum, housing natural history, Native American and fine art collections; Sylvester House, the home of an 1856 settler; and The Evergreen State College. Olympic National Park and Mount Rainier National Park are nearby.